Corporal John Edward Leslie HOURIGAN (45th Battalion) was promoted to Sergeant in France. Private Andrew James MCGREGOR (2nd Australian Field Bakery) departed England aboard the HT Gaika bound for Australia for medical discharge. The guns fell silent, and all fighting ceased on the Western Front at 11.00 am when the Armistice, signed by senior Allied and German representatives in the forest at Compiègne in France earlier that morning, came into effect. 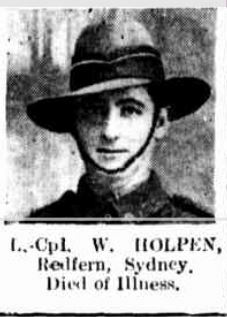 Private Percy Walter HOLPEN (36th Battalion) was admitted to the 30th General Hospital at Calais, France, suffering from Influenza. 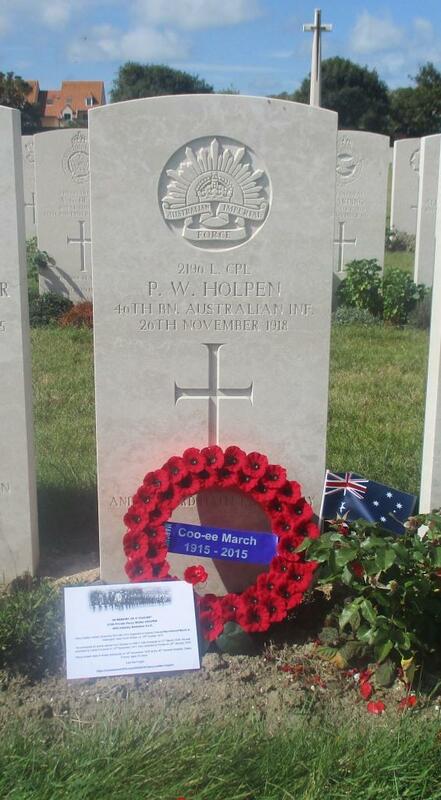 Private Percy Walter HOLPEN (36th Battalion) died from Influenza – he was buried at Les Baraques Military Cemetery, Calais. Private William Laurence HUNT (45th Battalion) arrived in Australia aboard the HMAT Runic for medical discharge. Bill and Jack Hunt. Photograph courtesy of Iain and Judy Macdonald. Letter written by Cyril Roy MCMILLAN (45th Battalion) [ex prisoner of war] on this day was later published in The Cumberland Argus and Fruitgrowers Advocate. Extract: … We were released about two weeks ago. They just cast us adrift and told us to find our way back. They never gave us any bread to start with, not even a bite. Only for the Belgians we should have had hundreds of deaths along the road. But the Belgians cared for us in every manner possible … We crossed the British lines on the 17th Nov., and we were heartily greeted by our own lads. Several of us had to go to hospital through sickness. I am in hospital at present, but will be across to England for Christmas, and hope to be home in Parramatta shortly afterwards’. Private John William THOMPSON (54th Battalion) was admitted to the 4th General Hospital at Camiers, France, following being wounded in action for the 2nd time on 29th September, receiving a gunshot wound to his left hand. Private John William THOMPSON (54th Battalion) was placed aboard a hospital ship for evacuation to England – he was admitted to the Ontario Military Hospital at Oplington, England, later that day. Private George EAVERS (4th Pioneer Battalion) was discharged medically unfit. Private John William THOMPSON (54th Battalion) was discharged from hospital and granted leave, to report to the No. 4 Command Depot on 12th November at Hurdcott, England. 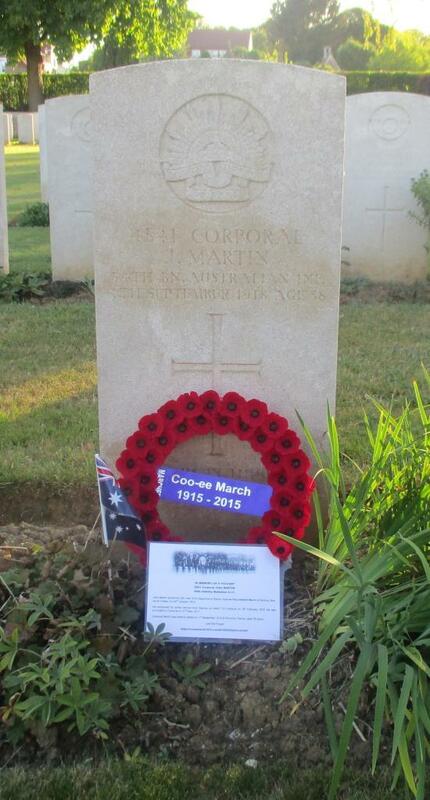 Corporal John MARTIN (54th Battalion) was killed in action during the successful assault on Peronne, France – he was buried in Peronne Communal Cemetery Extension, at Peronne, France. Private Jacob Isak PALMGREN (34th Battalion) who had been wounded in action for a second time in France with a gunshot wound to his nose on 31st August 1918, was admitted to the 2nd General Hospital in Le Havre, France, then was transferred to the No. 1 Convalescent Depot at Le Havre on 7th September 1918. Second Lieutenant Thomas Walter DOWD (2nd Australian Machine Gun Battalion) was wounded in action with a gunshot wound to the face and hands. He was admitted to the 5th Field Ambulance suffering shrapnel wounds to the face and hand. He was moved back to the 53rd Casualty Clearing Station, then to the 20th General Hospital, at Camiers, France. Lance Corporal William John SHANNON (4th Pioneer Battalion) was discharged medically unfit [Hallux Valgus]. Private Alfred WARDROP (45th Battalion) was discharged medically unfit [amputation left leg]. Private Jacob Isak PALMGREN (34th Battalion) was discharged from No. 1 Convalescent Depot at Le Havre. 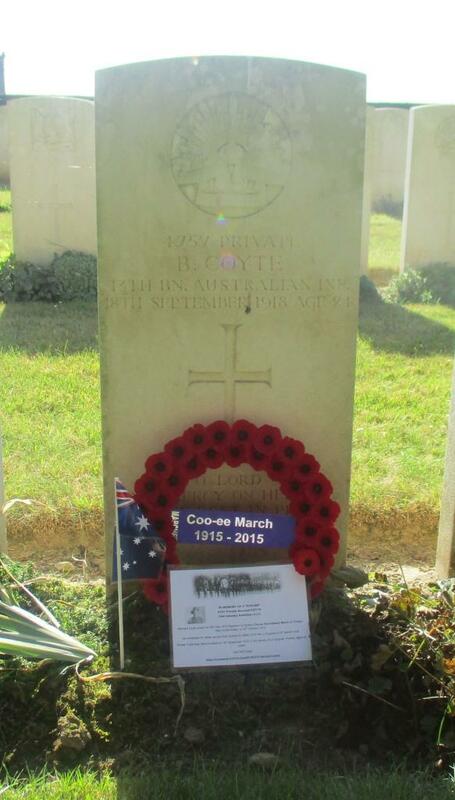 Private Bernard COYTE (13th Battalion) was killed in action during an attack launched by the 13th Battalion on the German lines south of the village of Le Verguier, France – he was buried at the nearby Jean Court Communal Cemetery Extesion. 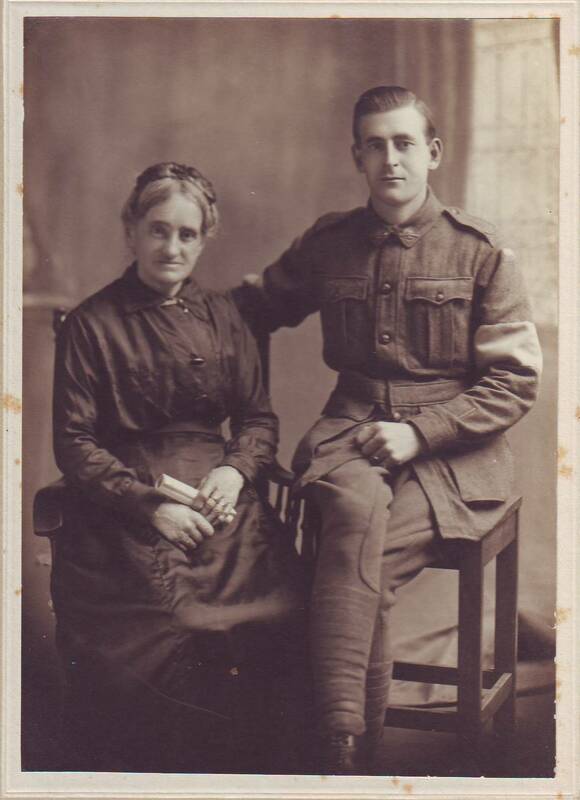 Gunner James TAYLOR (4th Field Artillery Brigade) was wounded in action with gunshot wounds to his thighs – he was moved back to an Australian Field Ambulance, then to the 20th Casualty Clearing Station. He was then placed aboard the 3rd Ambulance Train and moved to a hospital in Rouen France, where he was admitted on 19th September 1918. Sergeant James Gerald CAMERON (45th Battalion) for his action on this day during an attack west of Bellenglise in France, was subsequently awarded the Distinguished Conduct Medal. Private Edgar Lewis CUDDEFORD (45th Battalion) for his action on this day as a runner during an attack in the vicinity of Le Verguier in France, was subsequently awarded the Military Medal. Second Lieutenant Thomas Walter DOWD (2nd Australian Machine Gun Battalion) was discharged from the 20th General Hospital, at Camiers, France. Gunner James TAYLOR (4th Field Artillery Brigade) was placed aboard a hospital ship for evacuation to England. Gunner James TAYLOR (4th Field Artillery Brigade) was admitted to the Alexandria Hospital at Cosham, England, with a severe gunshot wound to the thigh. Private William Laurence HUNT (45th Battalion) departed England aboard the H.M.A.T. Runic for return to Australia for medical discharge. Private George DAVIDSON (4th Pioneer Battalion) was discharged medically unfit [deformity to the left elbow]. Private Percy Frederick COOPER (45th Battalion) was promoted to Lance Corporal. Private John William THOMPSON (54th Battalion) was wounded in action in France for a second time with a gunshot wound to his left hand – he was sent to a Field Ambulance, then to the 30th Casualty Clearing Station. Lance Corporal William John SHANNON (4th Pioneer Battalion) arrived in Australia aboard the H.M.A.T. Essex for medical discharge. Private George EAVERS (4th Pioneer Battalion) arrived in Australia aboard the H.M.A.T. Essex for medical discharge. Private William Charles ELLERY (45th Battalion) was discharged medically unfit [chronic rheumatic arthritis]. Corporal Alfred Fletcher MCLEAN (2nd Divisional Artillery Column) was wounded in action near Warfusee-Abancourt in France with a gunshot wound to his neck. He was sent to the 5th Australian Field Ambulance. Corporal Alfred Fletcher MCLEAN (2nd Divisional Artillery Column) was admitted to the 55th Casualty Clearing Station. Corporal Alfred Fletcher MCLEAN (2nd Divisional Artillery Column) was admitted to the No. 11 Stationary Hospital at Rouen, France. Private William CAIRNS (13th Battalion) was discharged in Sydney medically unfit [trachoma]. Corporal Alfred Fletcher MCLEAN (2nd Divisional Artillery Column) was evacuated to England on a hospital ship. Private Albert DENZEL (45th Battalion) for his action manning a Lewis gun in the vicinity of Lihons, France, was subsequently awarded a Military Medal. Corporal Alfred Fletcher MCLEAN (2nd Divisional Artillery Column) was admitted to the Bath War Hospital in England. Private William Allan Luther PHILPOTT (69 Squadron Australian Flying Corps) was discharged medically unfit [D.A.H.]. Private William Henry GRIFFITHS (Australian Motor Transport Service) married Miss Kathleen Spires at Christ Church, Chelsea, England. Private Jacob Isak PALMGREN (34th Battalion) was slightly wounded in action when the 34th Battalion was in the line near Vaire-sous-Corbie, France. He remained on duty with the Battalion. Private Jacob Isak PALMGREN (34th Battalion) was wounded in action for a second time with a gunshot wound to his nose, when the 34th Battalion was attacking along the Somme River between Bray and Curlu, France. He was admitted to the 53rd Casualty Clearing Station. Private Thomas ANDERSON (13th Battalion) was discharged medically unfit [ankylosis right thumb]. Private George EAVERS (4th Pioneer Battalion) departed England aboard the transport Essex for return to Australia for medical discharge. 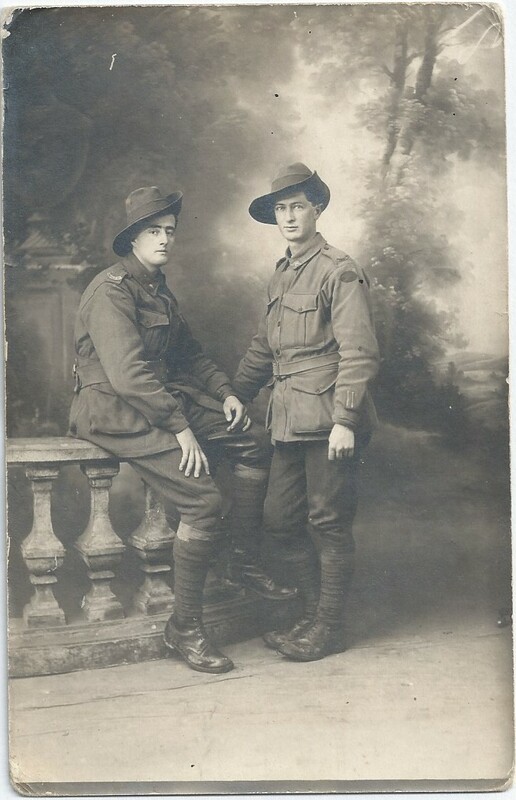 Lance James MAHER (45th Battalion) was discharged medically unfit gunshot wound to his left ankle [tarsus C. fracture]. Private Frank BLACK (42nd Battalion) was discharged medically unfit [chronic rheumatism]. Corporal Lewis Reginald DUFF (45th Battalion) was promoted to Sergeant. Private Sidney Stanley CANNON (4th Pioneer Battalion) was discharged medically unfit [gunshot wound, right ankle debility and tachycardia]. Lance Corporal John Graham WATSON (13th Battalion) was discharged medically unfit [nephritis gas poisoning]. Lance Corporal Thomas Walter DOWD (19th Battalion) was appointed as Second Lieutenant and was posted to Machine Gun Corps Reinforcements for the 2nd Machine Gun Battalion. Private Thomas ANDERSON (13th Battalion) arrived in Australia Sydney aboard the H.T. Borda for medical discharge. Private Jacob Joseph Jacob John HERRINGE (13th Battalion) was evacuated to England aboard the hospital ship Princess Elizabeth suffering trench fever, and was admitted to the Reading Military Hospital later that day. Private Leslie Webster GREENLEAF (13th Battalion) was placed aboard the 39th Ambulance Train, after being wounded on 20th May with a bomb wound to his left arm in the vicinity of Villers-Bretonneux. Private Leslie Webster GREENLEAF (13th Battalion) was evacuated to England by Hospital Ship Panama (gunshot wound left arm). Private Leslie Webster GREENLEAF (13th Battalion) was admitted to the Kitchener Military Hospital at Brighton, England. Lance Corporal William Henry PEPPERNELL (33rd Battalion) was wounded in action for a second time, in the vicinity of Villers-Bretonneux, receiving a flesh wound to this left arm, and was sent to the 10th Australia Field Ambulance, then moved to the 5th Casualty Clearing Station. Private Walter CAVILL (55th Battalion) arrived in Australia aboard the H.M.A.T. Suevic for medical discharge. Lance Corporal William Henry PEPPERNELL (33rd Battalion) was admitted to the 12th General Hospital at Rouen, France. Private Joseph PARRISH (4th Machine Gun Battalion) was wounded in action in the vicinity of Villers-Bretonneux, where he received a gunshot wound to his neck, and was take to the 4th Australian Field Ambulance, and later that day taken to the 61st Casualty Clearing Station. Lance Corporal William Henry PEPPERNELL (33rd Battalion) was evacuated to England aboard the HS Grantully Castle. Private Leslie Webster GREENLEAF was transferred to the 1st Australian Auxiliary Hospital at Harefield, England. Private Joseph PARRISH (4th Machine Gun Battalion) was placed aboard the 17th Ambulance Train to be taken to the 53rd General Hospital at Boulogne, France. Lance Corporal William Henry PEPPERNELL (33rd Battalion) was admitted to the Horton County of London War Hospital at Epsom. Private Joseph PARRISH (4th Machine Gun Battalion) was admitted to the 53rd General Hospital at Boulogne, France, with a gunshot wound to his neck, where he was also diagnosed with bronchial pneumonia. Private Charles Henry MAIDENS (13th Battalion) arrived in Australia aboard the H.M.A.T. Marathon for medical discharge. Private Leslie Webster GREENLEAF was discharged from hospital on leave from 13th June 1918, to report to No. 1 Command Depot at Sutton Veny on 27th June 1918. 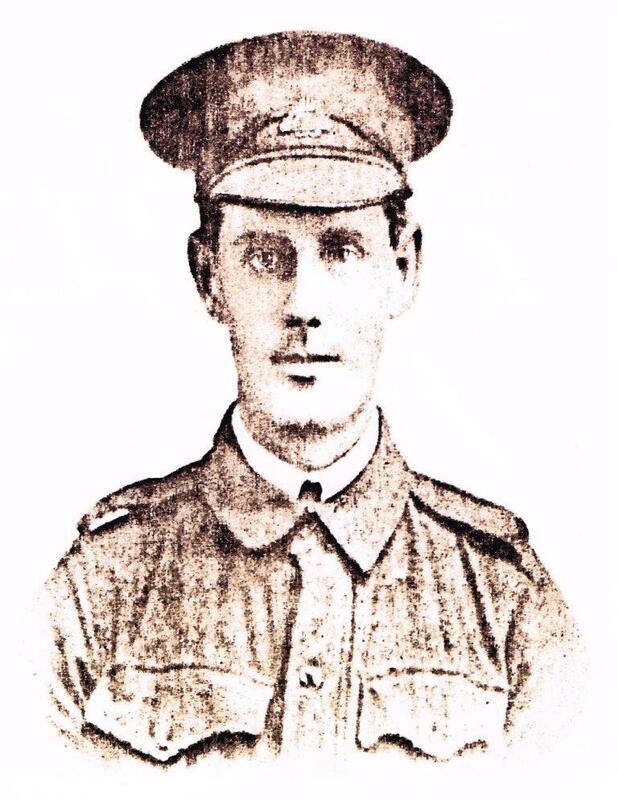 Private William Charles ELLERY (45th Battalion) arrived in Australia aboard the H.T. Dunvegan Castle for medical discharge. Lieutenant John Robert LEE (21st Battalion) was discharged medically unfit. 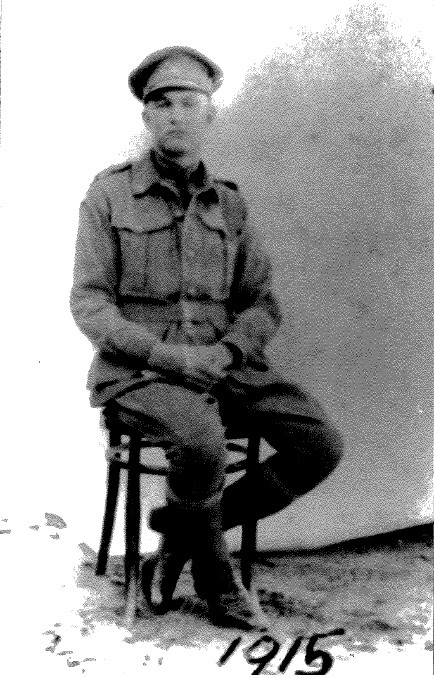 Private Andrew James MCGREGOR (2nd Australian Field Bakery) was admitted to hospital with sclerosis spinal cord. Lance Corporal William Henry PEPPERNELL (33rd Battalion) was transferred to the 3rd Australian Auxiliary Hospital at Dartford, England. 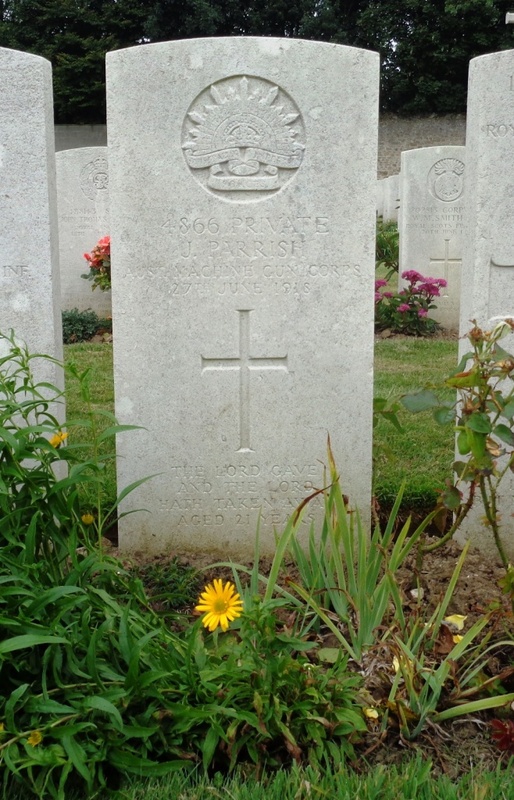 Private Joseph PARRISH (4th Machine Gun Battalion) died of wounds at the 53rd General Hospital, Boulogne. He was buried in the Terlincthun British Cemetery, France. Lance William John SHANNON (4th Pioneer Battalion) departed England aboard the H.M.A.T. Essex bound for Australia for medical discharge. Private Andrew James MCGREGOR was evacuated to hospital in England on 30th June 1918 (sclerosis spinal cord). Sergeant James Gerald CAMERON (45th Battalion) was wounded in action with a gunshot wound to his left shoulder during fighting around Villers-Bretonneux, and he was sent to the 12th Australian Field Ambulance. On the 2nd of May 1918 Private Jacob Isak PALMGREN (34th Battalion) was admitted to the 3rd Stationary Hospital at Rouen with Influenza. Lance Corporal Reginald Henry CHAMBERLAIN (35th Battalion) was moved back to the 12th Casualty Clearing Station (after being gassed in the vicinity of Morlancourt, France, on 30th April 1918). Sergeant James Gerald CAMERON (45th Battalion) was evacuated to the 61st Casualty Clearing Station. Corporal John MARTIN (54th Battalion) was sent to Hospital in England aboard a hospital ship, (with a gunshot wound to the chest he received on 24th April 1918 in the vicinity of Villers-Bretonneux, France). Corporal John MARTIN (54th Battalion) was admitted to the 5th Southern General Hospital at Portsmouth, England. Sergeant James Gerald CAMERON (45th Battalion) was admitted to the 1st Canadian General Hospital. Private Thomas ANDERSON (13th Battalion) departed Cape Town, South Africa, aboard the H.T. Borda, bound for Australia for medical discharge. Private Charles Edward BOW (4th Pioneer Battalion) was discharged from the A.I.F. in Sydney medically unfit (chronic bronchitis). Lance Corporal Reginald Henry CHAMBERLAIN (35th Battalion) was moved to the 3rd Australian General Hospital at Abbeville, France. Lance Corporal Frederick Graham HARVEY (4th Pioneer Battalion) was sent to the 12th Australian Field Ambulance in France suffering from bronchitis, and he was moved to the 61st Casualty Clearing Station later that day. Private Jacob Isak PALMGREN (34th Battalion) was discharged from the 3rd Stationary Hospital at Rouen and transferred to No. 2 Convalescent Depot at Rouen, then moved the next day to the No. 1 Convalescent Depot at Rouelles, France (recovering from influenza). 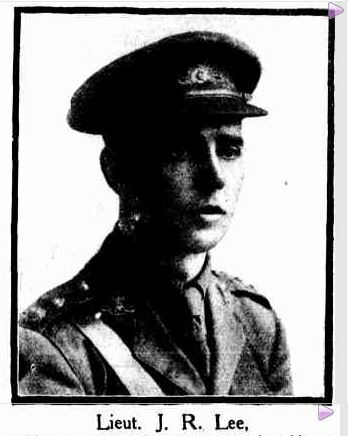 Trooper William Henry NICHOLLS (7th Light Horse Regiment) was one of those killed when eight enemy aeroplanes bombed the camp of the Regiment at Jericho, Palestine. Lance Corporal Frederick Graham HARVEY (4th Pioneer Battalion) was placed aboard the 27th Ambulance Train in France. Lance Corporal Frederick Graham HARVEY (4th Pioneer Battalion) was admitted to the 6th General Hospital at Rouen, France (bronchitis). Private Jack Graham WIGGINS (45th Battalion) was discharged from hospital in England (following being wounded in action receiving a shrapnel wound to his left thigh on 28th March 1918). Lance Corporal Reginald Henry CHAMBERLAIN (35th Battalion) was placed aboard a Hospital Train and taken to the coast in France. Lance Corporal Reginald Henry CHAMBERLAIN (35th Battalion) was evacuated to England by Hospital Ship, and admitted to the Whipps Cross Hospital at Leytonstone, England, on the same day. Lance Corporal Frederick Graham HARVEY (4th Pioneer Battalion) was placed aboard the Hospital Ship Grantully Castle for evacuation to England (bronchitis). Lance Corporal Frederick Graham HARVEY (4th Pioneer Battalion) was admitted to the Winchester General Military Hospital in England. Corporal John MARTIN (54th Battalion) was transferred to the 3rd Auxiliary Hospital at Dartford, England. Private Cyril Roy MCMILLAN (45th Battalion) (who had been reported Missing In Action on 5th April 1918 when the 45th Battalion had been in action around Dernacourt, France), was reported to be a Prisoner of War. On 17th May 1918 Private Jacob Isak PALMGREN (34th Battalion) was discharged from hospital. Corporal John MARTIN (54th Battalion) was discharged from hospital and went on leave reporting back to the 4th Convalescent Depot at Hurdcott, England, on 31st May 1918. Private Jacob Isak PALMGREN (34th Battalion) was moved from the No. 1 Convalescent Depot at Rouelles where he had been recovering from Influenza to the Australian Infantry Base Depot on Havre, France. 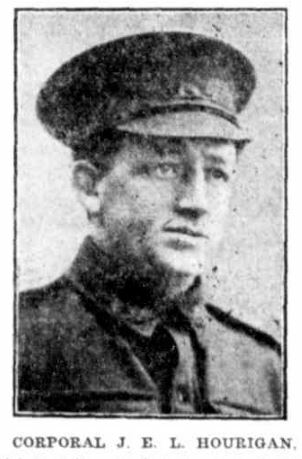 Private Leslie Webster GREENLEAF (13th Battalion) was wounded in action for a second time in the vicinity of Villers-Bretonneux, with a bomb wound to his left arm. He was admitted to the 13th Australian Field Ambulance, the taken to the 47th Casualty Clearing Station. 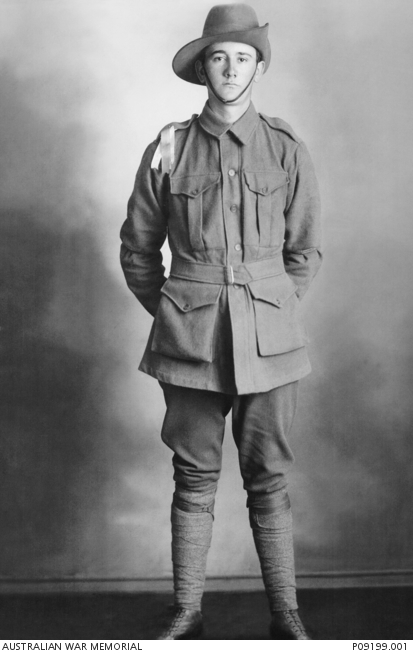 Trooper Joe BILLING (7th Light Horse Regiment) was sent to the Australian Rest Station at Jericho, Palestine, suffering malaria. Trooper Joe BILLING (7th Light Horse Regiment) was moved back to the 65th Casualty Clearing Station, then the 75th Casualty Clearing Station at Jerusalem (sick with malaria). Sergeant James Gerald CAMERON (45th Battalion) was transferred to the 1st Australian Auxiliary Hospital at Harefield, England. Private Norman Hamond FRANCISCO (4th Pioneer Battalion) was wounded when his Battalion was bombed by enemy aircraft when it was in billets around the village of Busy, France, receiving a bomb wound to his leg. He was sent to the 4th Australian Field Ambulance. Private Charles CREASE (13th Battalion) arrived in Australia aboard the H.T. Field Marshall for medical discharge. 3rd Air Mechanic William Allan Luther PHILPOTT (69th Squadron, Australian Flying Corps) arrived in Australia aboard H.M.A.T. Field Marshall for medical discharge. Trooper Joe BILLING (7th Light Horse Regiment) was moved back by Hospital Train to the 47th Stationary Hospital at Gaza (sick with malaria). Private Norman Hamond FRANCISCO (4th Pioneer Battalion) was moved back to the 5th Casualty Clearing Station. Private Leslie Webster GREENLEAF (13th Battalion) was admitted to the 47th General Hospital at Le Treport, France. Lieutenant John Robert LEE (21st Battalion) arrived in Australia aboard the H.M.A.T. Kanowna for medical discharge. Lance Corporal John Graham WATSON (13th Battalion) arrived in Australia aboard the H.M.A.T. Kanowna for medical discharge. 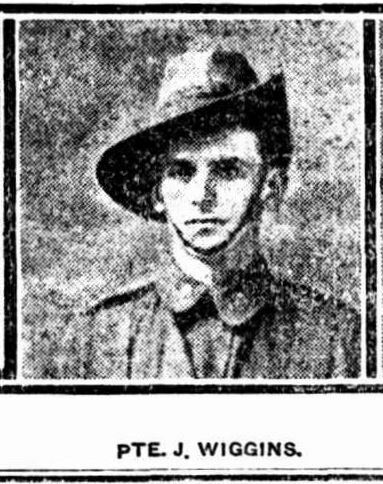 Private Joseph Jacob John HERRINGE (13th Battalion) was sent to the 4th Australian Field Ambulance in France suffering pyrexia, then was moved back to the 61st Casualty Clearing Station later that day. Private Joseph Jacob John HERRINGE (13th Battalion) was placed aboard the 20th Ambulance Train, and evacuated to the 56th General Hospital at Etaples, France, where he was admitted the next day (where he was later diagnosed with trench fever). Lance Corporal Reginald Henry CHAMBERLAIN (35th Battalion) was transferred to the 1st Australian Auxiliary Hospital at Harefield, England. Private Norman Hamond FRANCISCO (4th Pioneer Battalion) was placed aboard the 10th Ambulance Train and admitted to the 47th General Hospital later that day (bomb wound to his right leg). Trooper Leslie SULLIVAN (17th Company of the Imperial Camel Corps) was promoted to Lance Corporal in Egypt. Lance Corporal Reginald Henry CHAMBERLAIN (35th Battalion) was discharged from hospital and granted leave to report to the No. 4 Command Depot at Hurdcott, England, on 12th June 1918. Trooper Joe BILLING (7th Light Horse Regiment) was transferred from the 47th Stationary Hospital at Gaza to the 24th Stationary Hospital at Kantara, Egypt (sick with malaria). Trooper Joe BILLING (7th Light Horse Regiment) was transferred to the 14th Australian General Hospital at Abbassia, Egypt (sick with malaria). Private Jack Graham WIGGINS [45th Battalion) was placed aboard the Hospital Ship Ville de Liege for evacuation to England, where he was admitted to the Norfolk War Hospital (after being wounded in action on 28th March 1918 with a shrapnel wound to his left thigh). 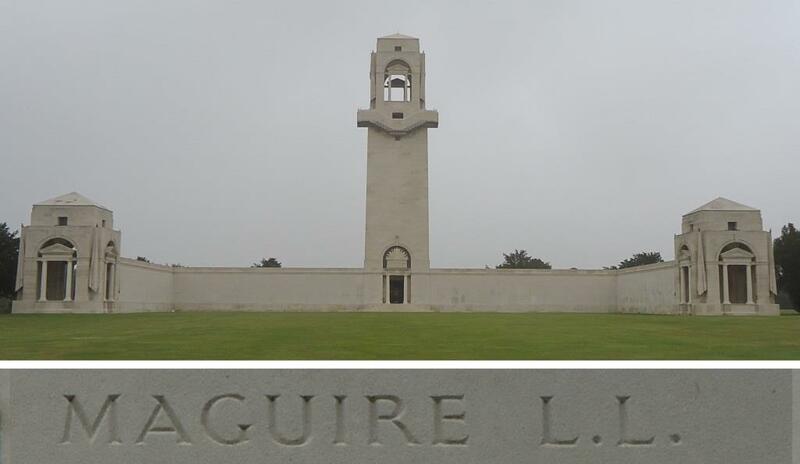 Lance Corporal Laurence Leslie MAGUIRE (45th Battalion) was killed in action during a German artillery barrage when manning the line against the German offensive near Dernacourt, France, on 2nd April 1918. He has no known grave. Trooper David James O’ROURKE (12th Light Horse Regiment) was part of a watering party at Jaffa, Palestine, when a horse kicked him in the left knee, and he was sent to the 4th Light Horse Field Ambulance. David James O’Rourke. Photograph courtesy of Warren O’Rourke. Trooper David James O’ROURKE (12th Light Horse Regiment) was sent to the 43rd Stationary Hospital. Private John Herbert WATTS (4th Pioneer Battalion) was sent to the 4th Australian Field Ambulance suffering from Influenza. He was later transferred to the 56th General Hospital in France. Sergeant Sydney Raymond CARVER (45th Battalion) was wounded in action for a second time in the vicinity of Dernacourt, France, during the Second Battle of Dernacourt, with a gunshot wound to his abdomen, and was sent to the 13th Australian Field Ambulance, then moved back the 29th Casualty Clearing Station. Private Cyril Roy MCMILLAN (45th Battalion) was reported missing in action in the vicinity of Dernacourt, France, during the Second Battle of Dernacourt – he was captured as a prisoner of war. Private John Thomas SMITH (4th Pioneer Battalion) was wounded in action in the vicinity of Henencourt Wood, France, by an artillery shell. Trooper David James O’ROURKE (12th Light Horse Regiment) was transferred to the 44th Stationary Hospital at Kantara, Egypt. 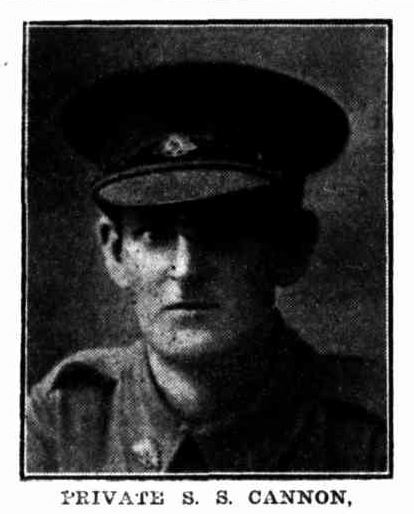 Private William WEBBER (45th Battalion) was killed in action in the vicinity of Dernacourt, France, when an artillery shell burst in the trench he was manning. Private John Thomas SMITH (4th Pioneer Battalion) was transferred to the 22nd General Hospital at Camiers, France . Trooper David James O’ROURKE (12th Light Horse Regiment) was transferred to the 14th Australian General Hospital at Port Said, Egypt. 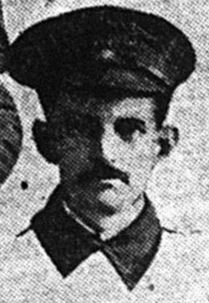 Sergeant Sydney Raymond CARVER (45th Battalion) was placed aboard the 27th Ambulance Train. Sergeant Sydney Raymond CARVER (45th Battalion) was placed aboard the 27th Ambulance Train and then admitted to the 7th Canadian General Hospital WHERE. Private John Thomas SMITH (4th Pioneer Battalion) was sent by hospital ship to England. Private John Thomas SMITH (4th Pioneer Battalion) was admitted to the Dorset County Hospital at Dorchester. Private John William THOMPSON (54th Battalion) was wounded in action with a shrapnel would to his left hand. Private John William THOMPSON (54th Battalion) was admitted to the 12th General Hospital at Rouen, France. 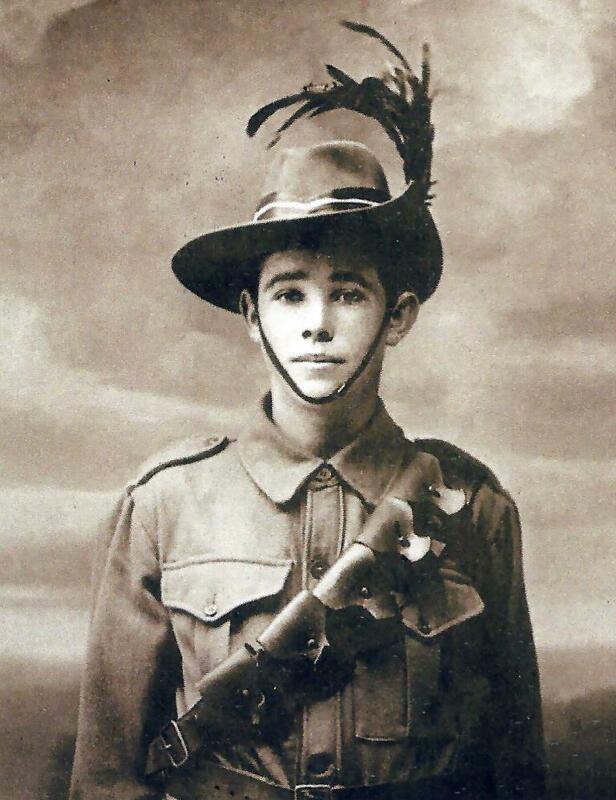 Private John William THOMPSON (54th Battalion) was sent to the 5th Australian Division Base Depot at Le Havre, France. Private Frank BLACK (42nd Battalion) departed England aboard the transport Marathon for return to Australia for medical discharge. Private Charles Henry MAIDENS (13th Battalion) departed England aboard the Transport Marathon for return to Australia for medical discharge. Private John Herbert WATTS (4th Pioneer Battalion) was evacuated to England, and admitted to the Northampton Hospital, suffering Trench Fever. 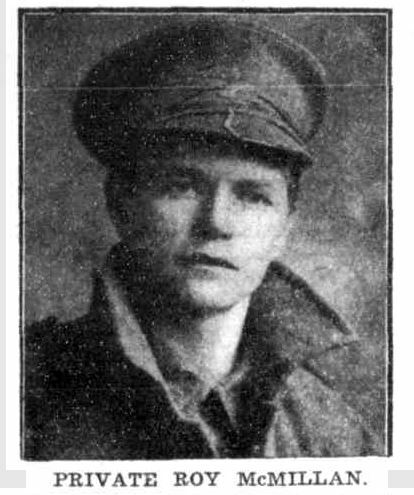 Private Walter CAVILL (55th Battalion) departed England aboard the Transport Suvic for return to Australia suffering Trench Fever. Private John Thomas SMITH (4th Pioneer Battalion) died of wounds at the Dorset County Hospital at Dorcherster. Private Percy George BROWN (54th Battalion) was wounded in action, being gassed in the vicinity of Villers Bretonneux, France, during the Second Battle of Villers-Bretonneux. Corporal John MARTIN (54th Battalion) was wounded in action in the vicinity of Villers Bretonneux with a gunshot wound to his chest, during the Second Battle of Villers-Bretonneux. He was taken to the 15th Australian Field Ambulance. Private Percy George BROWN (54th Battalion) was sent to the 10th General Hospital, at Rouen. Corporal John MARTIN (54th Battalion) was moved back to the 61st Casualty Clearing Station, then onto the 10th General Hospital at Rouen, France. Sergeant Sydney Raymond CARVER (45th Battalion) was placed aboard the Hospital Ship Princess Elizabeth for evacuation to England. Driver Peter WILSON (1st Field Engineers Squadron) was injured when he was thrown from a pontoon wagon at Jerusalem, Palestine. Sergeant Sydney Raymond CARVER (45th Battalion) was admitted to a hospital in England. 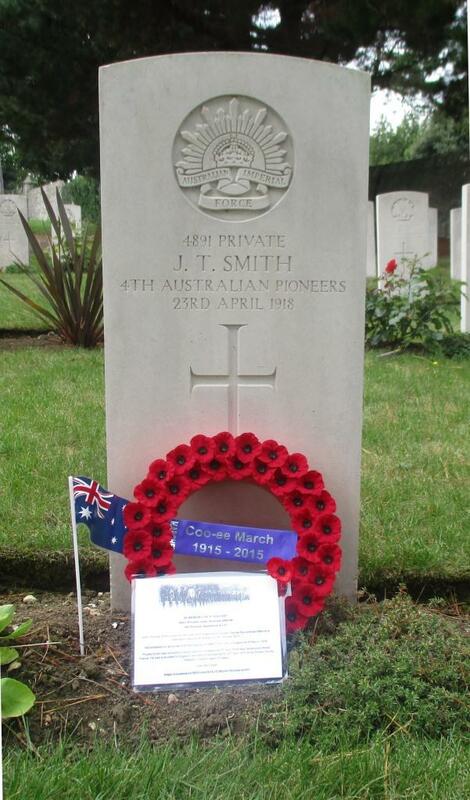 Private John Thomas SMITH (4th Pioneer Battalion) was buried at Melcomb Regis Cemetery in Weymouth, England, with full military honours. Private Percy George BROWN (54th Battalion) was sent to the 73rd General Hospital at Trouville, France. Private William Allan Luther PHILPOTT (13th Battalion) departed Durban, South Africa, on the H.M.A.T. Field Marshall, bound for Australia, for medical discharge. Private Charles CREASE (13th Battalion) departed Cape Town South Africa aboard the H.M.A.T. Field Marshall for return to Australia, for medical discharge. Lance Corporal Reginald Henry CHAMBERLAIN (35th Battalion) was wounded in action, being gassed, while manning the front line in the vicinity of Morlancourt, France, and he was evacuated to the 9th Australian Field Ambulance. Private John Herbert WATTS (4th Pioneer Battalion) was transferred to the 1st Australian Auxiliary Hospital at Harefield. Lance Corporal Henry MOSS (45th Battalion) was discharged medically unfit [gunshot wound to his left arm, compound fracture to the humerus]. Private John Thomas PARKER (4th Pioneer Battalion) was moved to the 2nd Casualty Clearing Station with Pyrexia. Private George Elsie EWENS (45th Battalion) was discharged medically unfit [gunshot wound to his groin]. Private John Thomas PARKER (4th Pioneer Battalion) was placed aboard the 19th Ambulance Train and admitted to the 55th General Hospital at Boulogne suffering trench fever. Private Alfred WARDROP (45th Battalion) arrived in Australia aboard the H.T. Corinth for medical discharge. Private Thomas ANDERSON (13th Battalion) departed England aboard the transport Durham Castle bound for Australia for medical discharge. 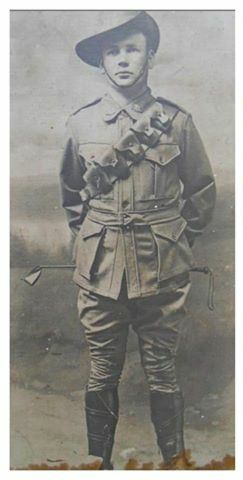 Lieutenant John Robert LEE (21st Battalion) left England aboard the transport Kenilworth Castle to commence his return to Australia for medical discharge. Private Charles CREASE (13th Battalion) left England aboard the transport Kenilworth Castle bound for Australia for medical discharge. Private William Allan Luther PHILPOTT (13th Battalion) departed England aboard the transport Kenilworth Castle bound for Australia for medical discharge. Private William Henry PEPPERNELL (36th Battalion) was promoted to Lance Corporal. Private William Charles ELLERY (45th Battalion) departed England aboard the H.T. Dunvegan Castle bound for Australia for medical discharge. Private John Thomas PARKER (4th Pioneer Battalion) was placed aboard the H.S. Cambria and evacuated to England, and admitted to the Tankerton Military Hospitable at Whitstable, with Trench Fever. Lance Corporal John Graham WATSON (13th Battalion) departed England aboard the transport Kanowna bound for Australia for medical discharge. Private Charles Edward BOW (4th Pioneer Battalion) arrived in Australia aboard the H.T. Euripides for medical discharge. Private Frederick Graham HARVEY (MM) (4th Pioneer Battalion) was promoted to Lance Corporal. Private Jack Graham WIGGINS [45th Battalion) was wounded in action for a second time in the vicinity of Dernacourt, France, with a shrapnel wound to his left thigh. Private Jack Graham WIGGINS [45th Battalion) was moved to the 56th Casualty Clearing Station, then admitted to the 20th General Hospital at Camiers, France. 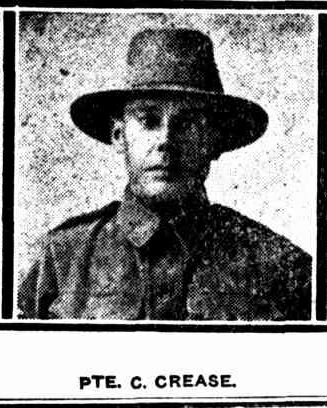 Sapper Samuel Mathew TANCRED (Engineer Depot, Sydney) was discharged medically unfit [tachycardia probably due to excessive cigarette smoking]. 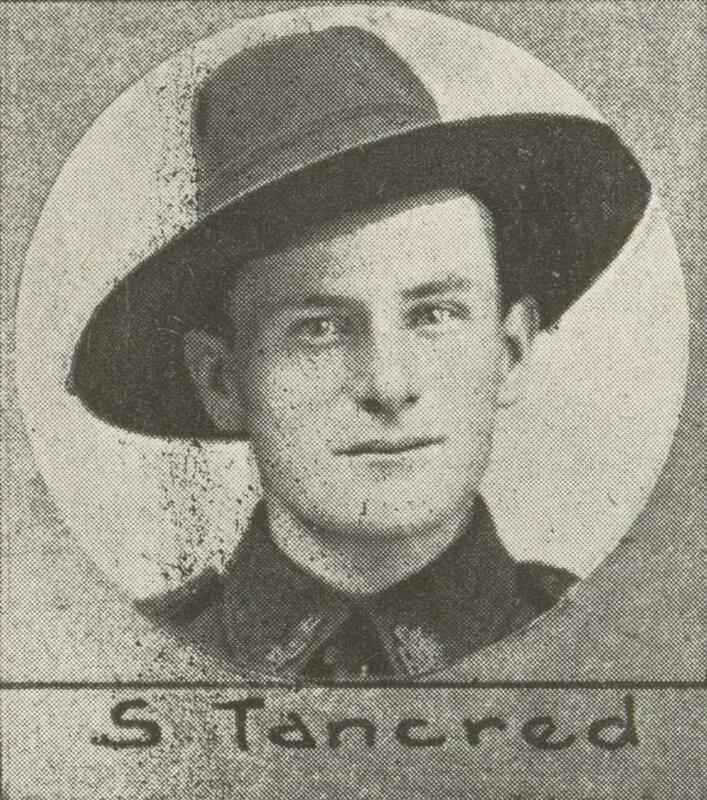 Private Sidney Stanley CANNON (4th Pioneer Battalion) arrived in Australia aboard the Transport Runic for medical discharge. Private William CAIRNS (13th Battalion) arrived in Australia aboard the Transport Runic for medical discharge. Lance Corporal James MAHER (45th Battalion) arrived in Australia aboard the Hospital Ship Kanowa for medical discharge. Private Reginald Henry CHAMBERLAIN (35th Battalion) was promoted to Lance Corporal. Private Richard EVANS (13th Battalion) was discharged medically unfit [defective vision].